Well, last week's Tech Tuesday post on the cool search engine WolframAlpha went over like a lead balloon, so this week it's back to Scrivener to learn about advanced search features. The easiest search to use in Scrivener is the Project Search, which is available from the Search box in the toolbar. You type in the word, word part, or phrase you're looking for, and a list of all documents containing your search string will appear in the binder. Click on each document to see the search string highlighted wherever it occurs in that file. To close the search results, click the small X at the bottom right corner of the Binder panel. 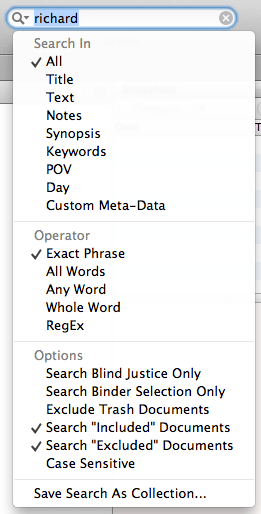 Now, what if you want to limit your search to your synopses, or you want it to be case-sensitive? Never fear, there's a menu for that. Just click on the magnifying glass (see image below). If you find yourself performing the same search repeatedly, click on Save Search As Collection. The saved search will retain all of your preferences, and show up in your Collections with the title you provide. Go to View–>Collections–>[name of saved search] to run the search anytime and view the results. One last note about searching. If you only want to search within the individual text document you're working on, go to Edit–>Find–>Find, and fill out the dialog box. As always, for more information, check out my book or online courses. Now that you know how to search, next week we'll discuss Project Replace. Happy hunting! LOL… well I did put Wordle right there in my research section in Scriv. so I could check redundancy as I went. But, yeah, Wolfie kinda ….. Course I threw the Wolfman some curve balls too. 🙂 And, there is that funky interface. I had a graphing the dew point in physics 101 flash back. My bad. Please don’t give up on the other stuff you find that is fun. Yeah, Wolfram’s a bit scientific, but it’s been invaluable when searching for things like sunrise/sunset on May 15 in Centreville, VA. And weather. But I’m finding more uses for it every day. One day my goal is to get a computer that supports Scrivener, until then…I am stuck. But I like to see what it can do…how nifty! And I just saved the Wolfram Alpha…because that will come in useful..
Great work, pleased to have stumbled on this place on blogs list. This is the sort of info that should be available around the net. You should really give consideration to putting up more stuff like this on web 2. 0 list. Shame on the search engines for not ranking this blog higher.